(CBS/KCNC) LITTLETON, Colo. - The FBI has a person of interest in connection with a pipe bomb and propane tanks discovered Wednesday at the Southwest Plaza Mall in Littleton, Colo. According to CBS affiliate KCNC, agents are taking a close look at surveillance video which shows what they said is a suspicious-looking person near where the pipe bomb was found. The FBI has released these surveillance pictures of the man they are looking for. 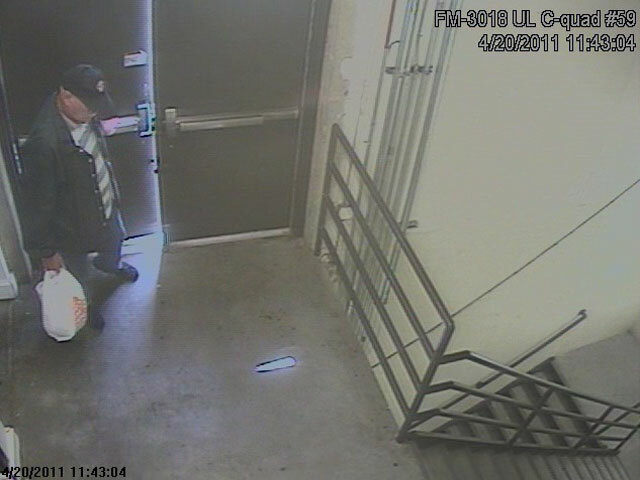 The subject is describe as a white male, with graying hair, a silver mustache, wearing a dark colored cap with a light colored logo on the front, gray and white horizontally striped shirt, dark jacket with silver buttons, blue jeans, and dark colored shoes. Anyone with information about this man is asked to call Jefferson County Sheriff's Office tipline at (303) 271-5615. Members of the Jefferson County Bomb Squad found two propane tanks and a pipe bomb inside the mall after a fire broke out near the food court. The mall is expected to remain closed until Thursday. The fire started at about 11:50 a.m. Wednesday. By 11:59 firefighters had extinguished the fire. Firefighters found a suspicious device at the origin of the fire, including two propane tanks and what was later revealed to be a pipe bomb. No one is in custody. The investigation involving the FBI and Jefferson County Sheriff's Office continues. The mall was evacuated as a precaution. Jefferson County officials said there are usually about 6,000 to 10,000 people in the mall around noon each day. About 300 employees also left the mall. The mall is about two miles from Columbine High School, where two students killed 12 classmates and a teacher before turning the guns on themselves on April 20, 1999. Unexploded pipe bombs and propane tanks were found in the school after the shootings. When asked about a possible connection to the 12th anniversary of the tragedy at Columbine, Kelley responded, "Ultimately it can't be ignored that today is the anniversary, it is something that will be looked at and is part of the investigation. It is disturbing that this is today."